The Global Volcanism Program has no activity reports for Acigöl-Nevsehir. The Global Volcanism Program has no Weekly Reports available for Acigöl-Nevsehir. The Global Volcanism Program has no Bulletin Reports available for Acigöl-Nevsehir. Acigöl-Nevsehir caldera is located in central Turkey and is traversed by the national highway between the towns of Acigöl and Nevsehir. The elliptical 7 x 8 km wide late-Pleistocene caldera is part of a now partially buried larger caldera and contains a group of maars, lava domes, basaltic lava flows, and pyroclastic cones. Three groups of obsidian lava flows have been dated; pre-collapse flows between about 190,000 and 180,000 years before present (BP), 75,000 yrs BP lava domes (such as Taskesik Tepe on the eastern side of the caldera) post-dating formation of the caldera, and young lava domes on the western caldera floor about 20,000 to 15,000 years old. Thirteen scoria layers from local tephras erupted between about 11,000 and 4300 years ago were found in sediment cores in the late Pleistocene Eski Acigöl maar. An ash layer from this volcanic group overlies 2300-1850 BCE artifacts of Roman-Cappadocian age. Pasquare G, 1968. Geology of the Cenozoic volcanic area of Central Anatolia. Roma Accad Nazionale Lincei Mem, 9: 55-204. There is no Deformation History data available for Acigöl-Nevsehir. There is no Emissions History data available for Acigöl-Nevsehir. 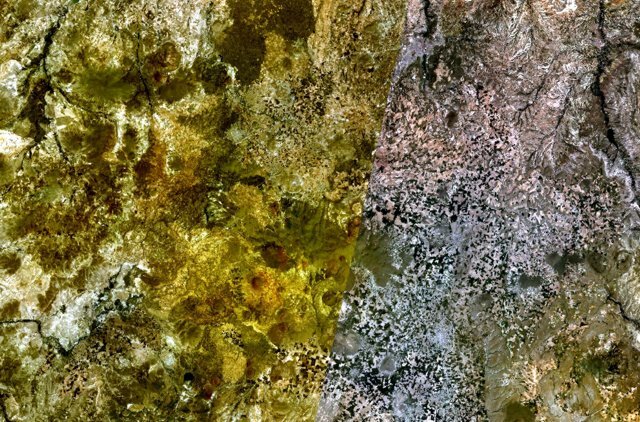 A large group of maars, lava domes, basaltic lava flows, and pyroclastic cones occupies the Acigöl-Nevsehir caldera in central Turkey in this NASA Landsat mosaic (with north to the top). The elliptical 7 x 8 km wide late-Pleistocene caldera, whose rim is not apparent in this image, is traversed by the national highway between the towns of Acigöl and Nevsehir (top-right, just right of the mosaic join line). There are no samples for Acigöl-Nevsehir in the Smithsonian's NMNH Department of Mineral Sciences Rock and Ore collection. Large Eruptions of Acigöl-Nevsehir Information about large Quaternary eruptions (VEI >= 4) is cataloged in the Large Magnitude Explosive Volcanic Eruptions (LaMEVE) database of the Volcano Global Risk Identification and Analysis Project (VOGRIPA).